The Rubbermaid Commercial Products configure waste receptacle, organic waste Trash can, 23 gallon provides a stylish way to collect waste in low-to-medium traffic areas. 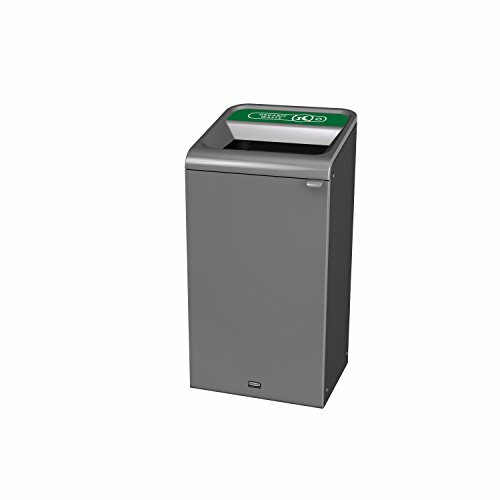 Constructed of corrosion-resistant heavy gauge steel with a damage-resistant powder coat finish and contoured edges for a modern appearance, the garbage can fits any commercial environment. This single stream Trash receptacle has a clearly marked color-coded Label and a large open top for collecting waste. Magnetic connections allow receptacles to attach to one another and stay arranged in the order that best fits the space – in a row or an Island. An easy-access front door and handle reduces strain on staff, while internal door Hinges protect walls from damage. Inside the Trash Bin, a rigid plastic liner features handles for more comfortable Trash removal, integrated cinches so bags won't slip and venting channels that allow air to flow into the can making removal easier. This container ships fully assembled.